The flyback system is a method that is widely used in switching power supplies up to 100W. As you may recall, we discussed the flyback as an example at the beginning of these articles. There are three types of flyback systems: self-exciting ringing choke converter (RCC), separate-excitation PWM type, and quasi-resonant type applying resonance technology to the RCC. The RCC type has been used mainly in small-power applications such as system auxiliary power supply units. However, because of somewhat increased design complexity when compared with the PMW type and due to the increasing popularity of PMW type ICs with built-in MOSFET, in small-power applications the RCC type is being supplanted by the PMW type. In the quasi-resonant type, controls are provided by a dedicated IC. Due to the fact that the PMW type features low noise and less losses compared with the PWM, it has made inroads into some applications. 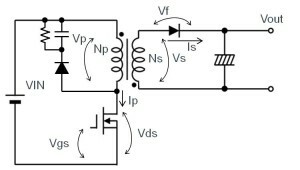 In AC/DC conversions, the flyback system, while frequently used in switching system-based AC/DC conversions, can also be used in transformer systems. Compared with the linear regulator, however, the flyback system requires more parts which entail increased costs; consequently its use is limited to applications requiring adequate insulation. A characteristic of the flyback system is simplicity, requiring fewer components as a switching regulator. In applications that do not require a great deal of output precision, an approximate output voltage can be set in terms of a transformer winding ratio for use as an unregulated power supply unit. Regulated output requires the addition of a circuit that controls the switching transistor. In addition, the flyback system offers the advantage of accommodating a wide input voltage range, at the expense of a relatively large peak current flowing into the switching elements, diodes, and output capacitors. An insulated power supply can be built by insulating the feedback line from the secondary side (output) by means of the optocoupler. We now describe the basic operation of the flyback system, in reference to Figure 18. When the MOSFET turns on, a current flows to the primary winding on the transformer, producing a build-up of energy. In this case, the diode remains off. When the MOSFET turns off, the stored energy is output from the secondary winding in the transformer through the diode. The subsequent rectification/smoothing actions generate a DC voltage. Because of these operations, the flyback system is sometimes referred to as an on/off system. 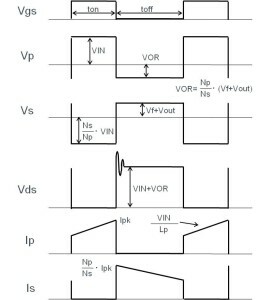 Figure 20 shows waveforms for the key nodes of the flyback system. 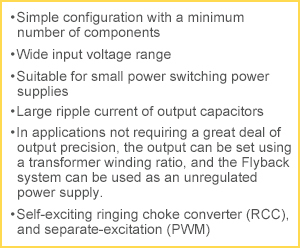 ・DC/DC conversions using a transformer have a wide range of applications. Therefore, a solid understanding of the basic operation of the flyback system is necessary.